Released earlier this year from Severin Films is a creepy little movie from the year of the slasher - 1981. Though not technically a slasher, this is more of a "killer kid" film, but it does possess some of the traits that define a slasher. 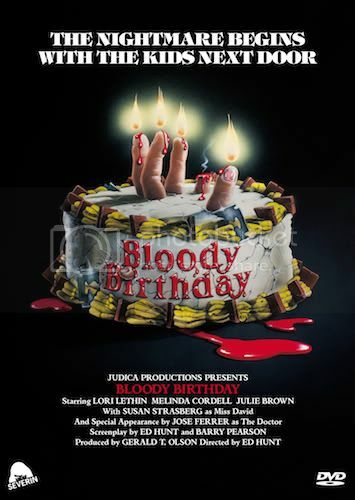 Though I had never seen Bloody Birthday before, I had heard the title several times over the years and the DVD's brilliant cover artwork (taken from the original movie poster) made it one I had to see. Bloody Birthday tells the story of Curtis (Billy Jacoby), Debbie (Elizabeth Hoy) and Steven (Andy Freeman) - three children born 10 years ago during a total eclipse. As it turns out, the eclipse caused the trio to be missing part of their personality - their emotions. The kids start murdering the townspeople one by one, carefully covering their tracks after each kill. Only their neighbors, classmate Timmy Russell (K.C. Martel) and his teenage sister Joyce (Lori Lethin) suspect that the kids are responsible. Bloody Birthday is one of the finer examples of the early 80s horror boom. The story is more original than the Friday the 13th clones being released weekly at the time and the acting was also surprisingly good (especially since half of the cast were children). You can't deny the influence of past films such as Village of the Damned and The Bad Seed, but instead of ripping off those films, Bloody Birthday updates some of the themes into a contemporary setting with new ideas. The kids here are gun-toting, opportunistic, manipulative murderers. The film is well made all around, with enough violence and suspense to keep you on the edge of your seat. And let's not forget Earth Girls are Easy's Julie Brown in the peephole. Classic. Severin's release of Bloody Birthday is excellent, with a nice anamorphic widescreen picture that looks great. Also included is a 51 minute audio interview with director Ed Hunt, a 10 minute interview with star Lori Lethin and a 15 minute documentary on the history of slasher films. Throw in four trailers from other Severin discs and you have a great film in an equally nice package. Did I mention it has the original poster art too (not the ugly cover on the old VCI release)?